There are many reasons to love sewing. There's the sense of pride and accomplishment you feel when you finish a project. Or, the joy and warmth that comes from giving a sewn gift. Then there's the inspiration that drives you to create something new, and the satisfaction of inspiring those around you. No matter why you love to sew, Baby Lock understands. Everything that we do – from discovering breakthrough technology to improving upon the simplest features – is to make your time sewing at your machine as enjoyable as possible. Baby Lock's main goal has been to enhance the love of sewing since our very beginning, over 40 years ago. In 1964, several engineers and middle managers at a Japanese industrial company believed that they could redesign the industrial serger they were currently manufacturing to be smaller and lighter. Their company rejected the concept, but the team was so committed to their idea that they quit their job and formed their own company. 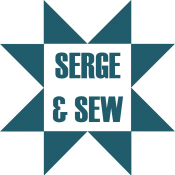 They wanted to build a smaller "baby" serger for home sewers that was capable of producing an overlock stitch. This was the birth of a machine called Baby Lock. Since then, Baby Lock has kept innovation and "the love of sewing" in mind for all of our products. Today Baby Lock is known worldwide for advancements in sergers – particularly the patented Jet-Air and ExtraordinAir Threading™ technology that threads an entire serger with the touch of a button. Baby Lock has continued to create products with the home sewer specifically in mind. Each sewing, embroidery and quilting machine is built with innovative functions and unique features that make every project easier to create. Baby Lock also has its own line of accessories and stabilizer, giving you Baby Lock quality every step of the way. Plus, when you visit a Baby Lock Retailer, you'll find Designer's Gallery software – a complete software suite designed to easily solve all of your embroidery challenges.